The Troubadour, LA's Sunset Strip. Early 1983. Mid-afternoon. This is where the story of The Man Who Would Be Nikki Sixx begins. And, in a way, ends. Matthew John Trippe had arrived in Los Angeles the year before. The 19 year old �Erie, Pennsylvania native had long nurtured dreams of becoming a rock star, and would board a Greyhound �bus that summer, bound for LA, intent on becoming one. While he arrived in Los Angeles with little in the way of personal belongings, in a deeper sense, Matthew Trippe would never quite leave behind the baggage of a childhood and upbringing riddled with self-doubt, pockmarked by his own sense of hopelessness. Trippe was adopted - along with his sister, Karen - at a young age. By all accounts, Trippe Sr. was a successful dentist who generously provided for his family, his wife a loving mother who doted on the children, especially Matthew. But cracks were beginning to appear in the All-American facade the Trippes presented to the outside world. That he would never know his birth mother, or father, �was an ongoing source of friction between Matthew and his adoptive parents. Further complicating the child's life was the lifelong affliction of a debilitating stammer, the shame of which - when not making him the object of �schoolyard abuse and brutal taunts - drove him into periods of intense withdrawal that unnerved and sometimes frightened his family. Seemingly overcome by self-esteem issues, or perhaps as a coping mechanism in the face of his own frustrations, Matthew would turn to Satanism, the Black Arts. When not forging checks - payable off his father's dental practice - to The Church of Satan, Matthew was worshipping at the altar of KISS, taking up guitar and emulating none other than "The Starchild" himself, Paul Stanley. After being thrown out of the local public high school for attacking one of his classmates with a Samurai sword, Matthew was packed off to an expensive boarding school, a move that would prove equally disastrous. Matthew returned home, only to run away again, a pattern that would repeat itself with alarming frequency over the years. It was in this climate of unrest - this snakepit of dead-end confusion and unfulfilled promise- that Matthew Trippe, looking for a way out, left home for good in the Summer of 1982. Arriving in LA, �Trippe first bought a used car, which he often slept in. Next, after scouting the local bar scene - Sunset Strip landmarks The Rainbow, Troubadour, and Whiskey A Go Go - Trippe would eventually settle on The Troubadour club his base of operations. Though the plan had been, and always would be, to make his stand as a musician, progress was slow. Initially, he would find himself whiling away entire afternoons ensconced at the bar, nursing a single beer, making small talk with the bartender, waitresses, fellow stragglers. 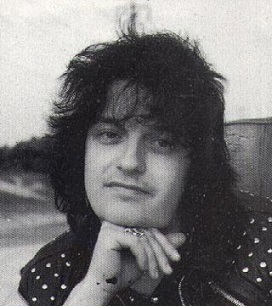 This is when, as he later would come to tell it, Trippe was approached by a man named Mick Mars. Mars was the �guitarist for Mötley Crüe, then what you would have called the new band on the street. Although the 'Crüe were essentially unknowns beyond the clique of Hair Metal musicians and hangers-on populating the Sunset Strip at the time, Mars nevertheless cut an imposing figure, with his full-on Goth attire and haunted, Kohl-encircled eyes. Trippe was stunned to learn Mars had been �watching him, sizing up this solitary figure at the bar, for days. Now it was time for Mick Mars to make his pitch. After buying Trippe a drink, Mars, with Trippe in tow, moved �to a corner of the bar where the two could talk privately. It was here that Mars laid out his dilemma. 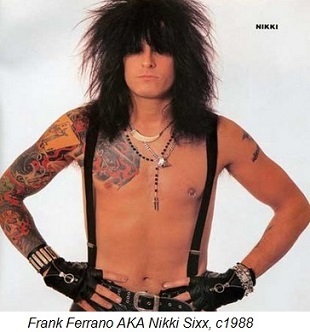 The Crüe's bassist, Frank Ferrano - who went by the stage name, Nikki Sixx - had been injured in a car accident. �And for a band who had just recently signed a lucrative deal with Elektra Records, whose star was on the ascendant, the timing couldn't have been worse. �Writing, recording and touring commitments were now pressing in on all sides, and without Sixx, there seemed little chance of the band fulfilling their contractual obligations to the record label. And this is where Matthew Trippe came in. Aside from bearing an uncanny physical resemblance to Ferrano, Trippe claimed he told ��Mars, when pressed, that he could play bass as well. The two left The Troubadour and next visited Mötley Crüe's manager, Doc McGhee, at his office in downtown LA, where Trippe auditioned for McGhee, playing four or five heavy metal songs in a row. When he finished, McGhee told him he was hired. Not to replace Nikki Sixx, but to be Nikki Sixx.